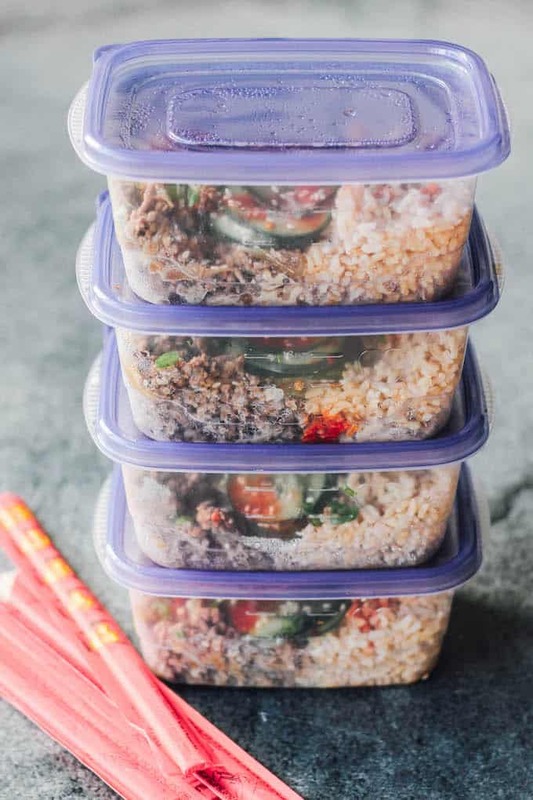 Today I’m sharing my recipe for Korean Beef Meal Prep Bowls! 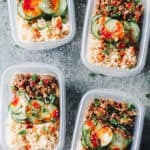 My favorite way to meal prep is to use shortcut recipes that save major time in the kitchen. 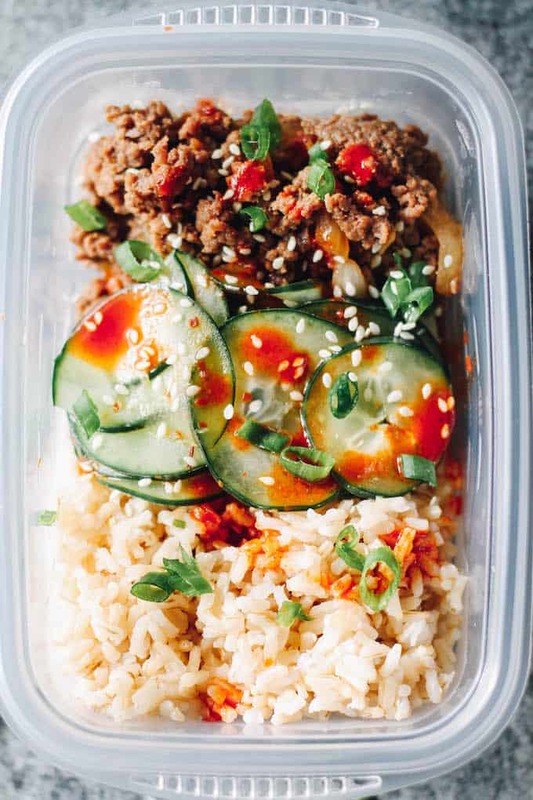 I paired this quick Korean Beef recipe and with the easiest cucumber salad and a side of brown rice for a light and filling meal that’s full of insane flavor! Korean beef (also known as bulgogi) is typically made by slicing beef roast into thin strips, marinating them in a sweet sesame soy sauce mixture, and grilling. For anyone new to Korean food, this is the dish to try first! With its sweet, bold and tangy flavor, people are immediately hooked. 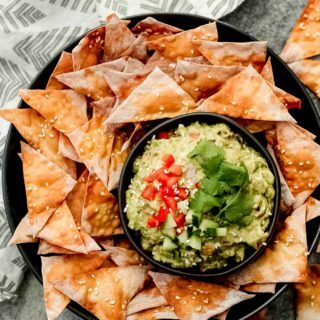 My kids absolutely devour this dish whenever I make it. But with all the slicing and marinating, I’m sure you can imagine the amount of prep work and time involved in making it. 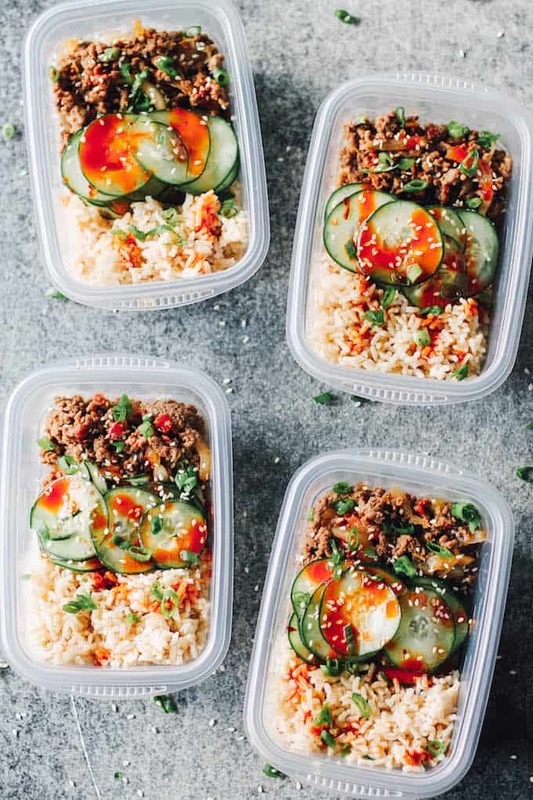 Luckily, I’ve got this quick Korean beef recipe in my back pocket for dinners on busy nights and for easy meal prepping of lunches. This version cuts the prep time down significantly, but still retains all the flavor of the original dish. For starters, I use ground beef. No hacking away at a big chuck roast! And instead of grilling, I cook the beef in a pan on the stove. Then, I add a simple sauce (similar to the marinade) to the pan and let all the flavors marry together as the meat cooks. In less than 10 minutes, the beef is ready to go! The cucumber salad is my super simple take on cucumber kimchi. Nothing fermented in this side dish. Just thinly sliced cukes, a bit of honey, and a splash of rice vinegar. It’s refreshing, crisp, slightly sweet, tangy, and the perfect complement to the boldly flavored beef! 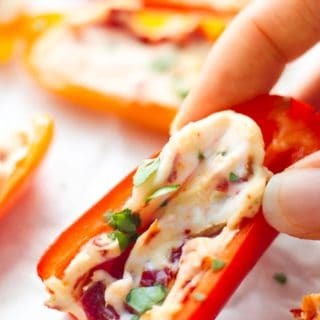 And if you’re a kimchi fan and love its spicy kick, add a pinch of red pepper flakes to the salad. I serve the beef and cucumber salad on a bed of brown rice and top it with a Korean red pepper sauce called gochujang. This sauce can be hard to find in a regular grocery store, so grab it online or use Sriracha as a substitute. 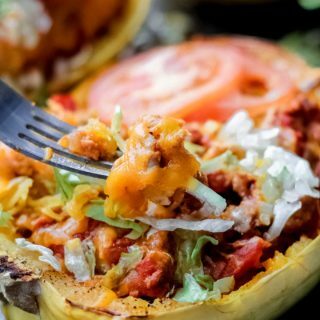 In fact, there are plenty of substitutes you can make for this dish based on your tastes and what’s in your fridge and pantry! In less than 20 minutes, you’ll have four prepped lunches (or dinners) ready for the week. If you’d like more servings, you can easily double the recipe for 8 meals. 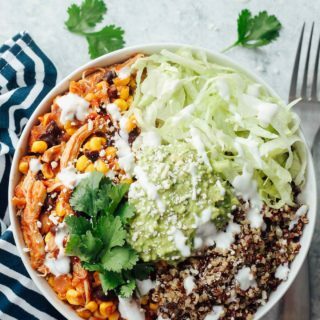 I’ve been eating these bowls all week for lunch and dinner, and I can’t tell you how amazing it’s been to not have to prep a lunch in the morning or dirty a bunch of dishes for dinner. It’s so nice to just grab the bowl from the fridge and pop it in the microwave. 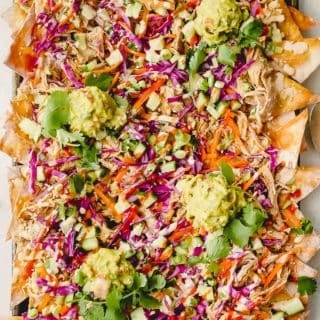 No more boring leftovers for lunch next week! 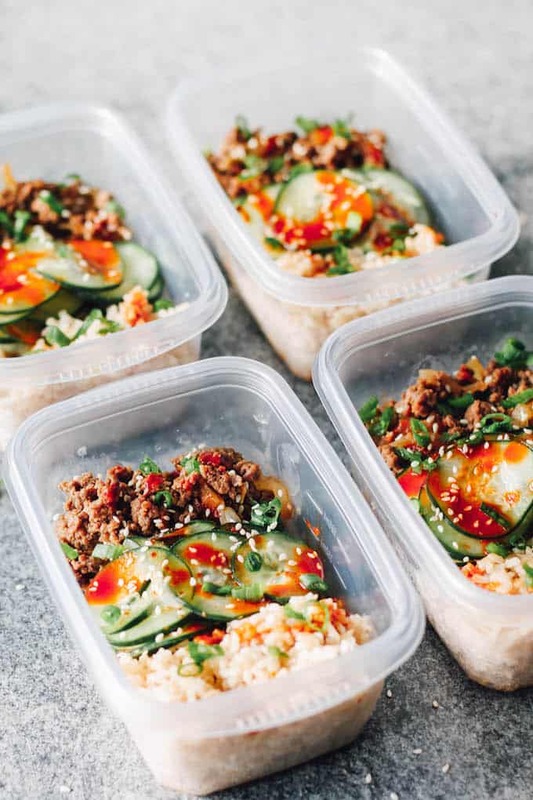 These Korean Beef Meal Prep Bowls will have you counting down the minutes until lunch hour! Note: This post contains an affiliate link, which means if you make a purchase via the link, I will receive a small commission at no additional cost to you. Thanks for your support! For the rice: Cook your brown rice according to package directions. While the rice is cooking, prepare the beef. For the beef: Whisk the garlic, ginger, 1 teaspoon sesame oil, soy sauce, and honey in a small bowl. Set aside. Heat the remaining teaspoon of sesame oil in a large sauté pan over medium heat. Once heated, add the onion and sprinkle with salt. Cook 4-5 minutes until softened. Add the ground meat to the pan. Use a spatula or wooden spoon to break up the meat into small chunks. Add the soy sauce mixture to the pan and stir to incorporate. Turn the heat up to medium-high. Cook for 5-7 minutes until the meat is cooked through. For the cucumbers: In a bowl, whisk the rice vinegar, honey, and red pepper flakes. Add the cucumbers and toss until coated. To prep: Add 1 cup brown rice, a heaping 1/2 cup of beef, and about 1/2 cup of cucumbers to each bowl. Drizzle gochujang sauce or sriracha over the everything. 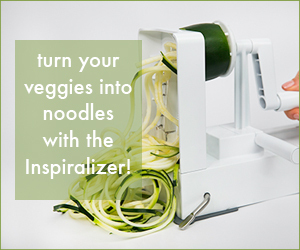 Finish with a sprinkle of sesame seeds and chopped green onion. I usually heat up the cucumbers in the bowl with the beef and rice, and they taste just fine. If you’d like your cucumbers cold, pack them separately from the beef and rice or remove them before heating. Lovely lunch boxes! 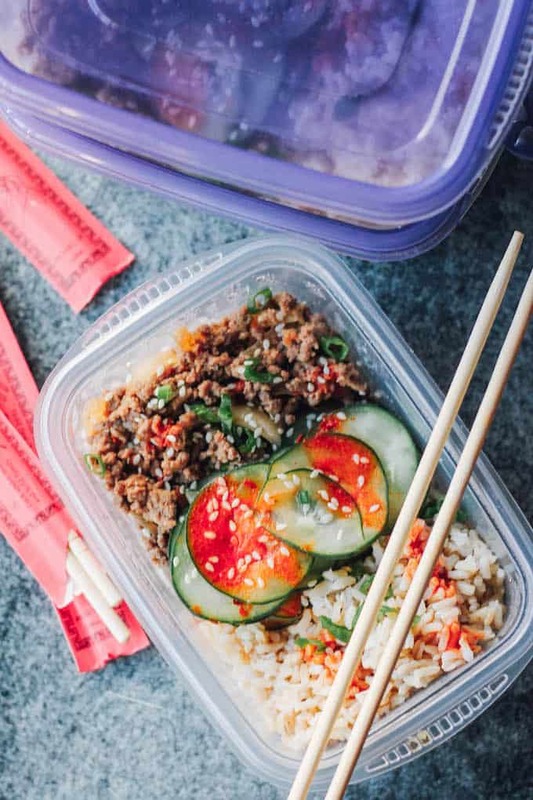 I love how you packed together with Korean beef and the cucumber salad. Thanks so much Holly! 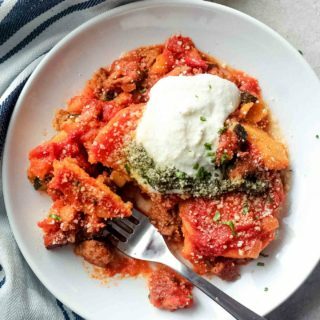 It’s such an easy and delicious meal! Hi Krista, if you use cauliflower rice as a substitute for brown rice do you pack it with the meal or separately? Hi Rebecca, my apologies for the extremely late reply. I would pack the cauliflower rice with the meal. That way, you can heat it up with the beef. Hey! Would you happen to know the nutrition information for this? Hi Jackie, I don’t have it recorded. But when I need nutrition info for a recipe, I usually go to MyFitnessPal and use their recipe nutrition calculator. It’s pretty easy to use! Hi Clare, thank you! I haven’t actually tried freezing this meal. But I would imagine the beef and rice would freeze just fine. Not so sure about the cucumbers though. I feel like they’d be extra watery upon freezing.